Sometimes when owners refuse to sell to developers—becoming “hold outs”—amazing results come about. Architect Clarence Fagan True was busy on the Upper West Side in the 1890s. He was responsible for dozens of row houses and commercial buildings; earning acclaim from some critics for creating the architectural personality of the area. Among his townhouses were five speculative row houses built for Harry Chaffee, including No. 249 West End Avenue. 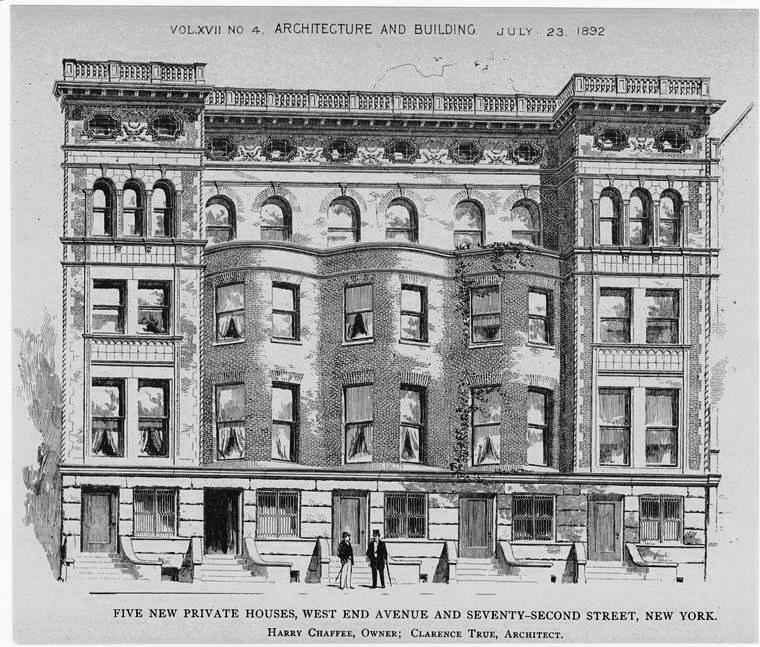 The five 15-foot wide residences were designed to imitate a single building with a unified rusticated base. The end homes rose straight up from the property line while the three middle residences had two-story bowed, undulating facades above the first floor that created third floor balconies. Clad in buff-colored ironspot brick, the fifth floor windows were framed by ornate terra cotta panels that created artistic openings--the one spot where True allowed embellishment to flex its muscle. The narrow, restrained residences were intended for successful, upper-middle class families. The three relatively unadorned middle homes relied on the end houses to carry off the design. Joseph Powell and his wife lived in No. 249 for a time. The pair had an unfortunate incident on December 14, 1894 when they thought that a ride around Central Park would be refreshing. Cabman John Dermody was driving the Powells and things were going nicely enough until the horse was spooked. The frightened animal ran away, overturning the carriage and tossing all three occupants to the stone pavement. Powell and the driver sprained their arms but Mrs. Powell escaped uninjured. 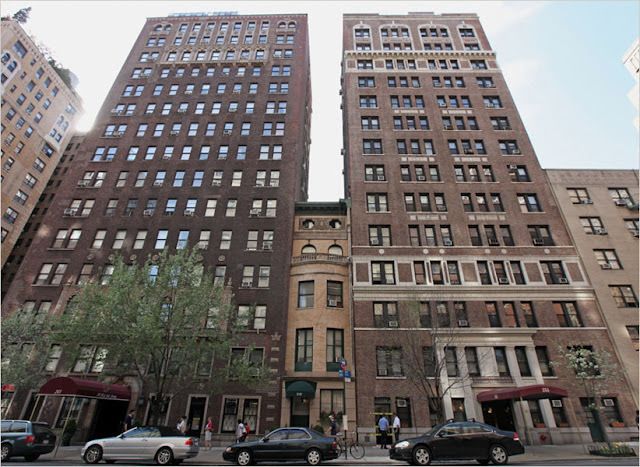 As the Upper West Side developed and gained popularity with financially-comfortable families, property values rose substantially. In 1898 the five homes were assessed for tax purposes at $16,000 each. One year later the figure rose to $18,000. Mrs. Cook, the former Mary Aldrich, came from an old New York family as well. The Aldrich family name carried some weight at the time among social circles. A graduate of Columbia University, Mrs. Cook was a member of the Daughters of the Revolution and active in the YWCA. Her husband was a member of the Society of Colonial Wars. Things were going well for the Cooks and their five children until the night of January 3, 1913. Despite the severe wind storm that was raging in the winter night, Cook left the house to go to a store at 72nd Street and Columbus Avenue. He never returned home. The distraught Mary issued “a confidential alarm” the following day asking that the hospitals be searched “in the expectation that Mr. Cook was injured in the wind storm.” Mary’s fears were well-founded. Ferdinand Huntting Cook died one month later, on February 1. Mary Cook remained in the house, sending her children off to college and entertaining for weddings and other social events. By 1915 the neighborhood was undergoing change, however. Stretches of brick and brownstone row houses, once the private homes of families like the Cooks, were being demolished by developers to be replaced by modern apartment buildings. Mary was approached with an offer to sell. She declined. Although her home was shaken and her peace broken by the demolition of her neighboring homes to the north, and the building of an apartment building there in 1916; Mary stood pat. Then, three years after she issued invitations for the marriage of her daughter, Beatrie Valerie Cook to Lester Darling Egbert, the process was repeated in 1924. The remaining houses on the block to the south were demolished and another gigantic building erected. Mary Cook had refused to sell and now her narrow, handsome home was an anachronism; a relic from the past sandwiched between the pages of the present. In May 1932 newspapers announced the death of Mrs. Ferdinand Huntting Cook. Her remarkably-surviving townhouse became the Uptown Gallery, run by Robert Ulrich Godsoe. Here for a decade the works of cutting-edge artists like Adolph Gottlieb and Mark Rothko would be shown. Then in 1941 the building was converted to apartments. Today the house that Mary Cook refused to sell sits tightly squeezed between its giant neighbors, looking much like an illustration from a children’s story book. I just wanted to let you know how much I enjoy your blog. I stumbled across it while researching my grandmother-in-law's family and now check it everyday. I am a Midwesterner who enjoys armchair travel. Keep up the good work. This was a great entry. Love the quirky hold-outs. From one Midwesterner to another, I'm glad you're enjoying the blog! Thanks for reading! And the current occupants are.......? I never intrude on the privacy of current owners unless given permission.